There are regular ferries between Hong Kong and Macau; in fact, it’s really the only way to travel between the two islands. But if you are heading to Macau’s casinos you may want to consider using the Cotaijet ferry from Hong Kong to Taipa rather than the usual route to the Macau FerryTerminal. Cotaijet offer services to the Taipa ferry terminal—the only ferry service to currently do so—located right on the doorstep of the major casinos on the Cotai Strip, including the Venetian Macau, City of Dreams Macau, and the Galaxy Macau. Ferries run from the Taipa ferry terminal, Macau ferry terminal in Sheung Wan/Central on Hong Kong Island, or, less frequently, to the Kowloon-China ferry terminal. On arrival at the Taipa ferry terminal in Macau, you will find complimentary shuttle buses to deliver you to casinos along the Cotai Strip. You do not need to be a guest to use the shuttle buses. There are ferries roughly every hour between 07:00 and midnight. If you want to return later than that you will need to use the more usual Macau ferry terminal route. 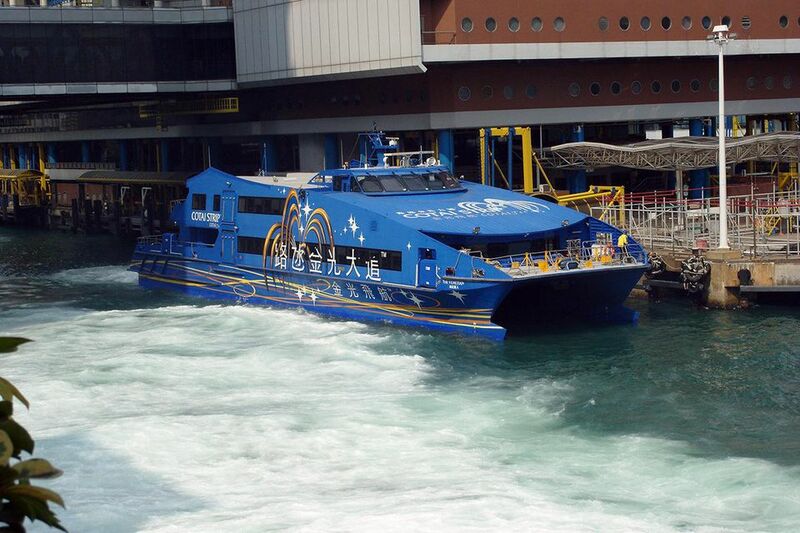 Cotaijet only operates high-speed catamarans so the journey between Hong Kong and Macau takes around 60-70 minutes. It's advisable to arrive at the ferry terminal at least 45mins prior to departure to clear customs and passport control.There is a full border between Hong Kong and Macau. Ticket prices are dependent on when you sail, with night sailings and weekends attracting a premium. Ticket prices range from $165 to $201 for standard fares. There are first class seats available but the difference in quality is negligible. It’s worth noting that tickets from Hong Kong are slightly more expensive than those from Macau. In an outrageously mean gesture, all kids above the age of one must purchase a ticket. There is a discount of 15% for those under 12 or over 60. Your ticket price includes 20kg of luggage. This can be taken on board. You'll need to check any extra luggage and pay a small fee. You can buy tickets in Macau at the Venetian and Sands casinos as well as at the ferry terminal itself. In Hong Kong you can buy tickets at the Hong Kong-Macau ferry terminal (where the ferry departs from) or at the Cotaijet counter at the China Ferry Terminal in Tsim Sha Tsui. You can also book on the Cotaijet website. Is it smooth sailing? The journey between Macau and Hong Kong is essentially inter-island and the sea is generally calm. There are times when inclement weather will affect sailings, such as during a black rain warning or in the event of a typhoon signal being hoisted. Warnings will be posted on TV, radio, at your hotel, inside casinos, and on the ferry website. It’s a rare occasion. Do I need to book ahead? In general, no, there is plenty of capacity. The exception is when sailing from Hong Kong on Friday evenings or Saturday mornings or trying to sail from Macau on night sailings on Friday, Saturday, or Sunday. Anything else I need to know? The ferries have basic facilities, including a small café and TVs that will pump incredibly annoying adverts at you for the full 60 min journey. Also, according to Cotaijet, their ferries are not only painted blue but an ‘exciting’ blue. Worth keeping in mind surely. Do You Need a Visa for Macau? No, most people don’t need a visa for Macau. US, Canadian, EU, Australian, and New Zealand passport holders visas will be given at least 30 days visa free stay in Macau upon arrival at the ferry terminal. You can find out more in our do I need a visa for Macau article.